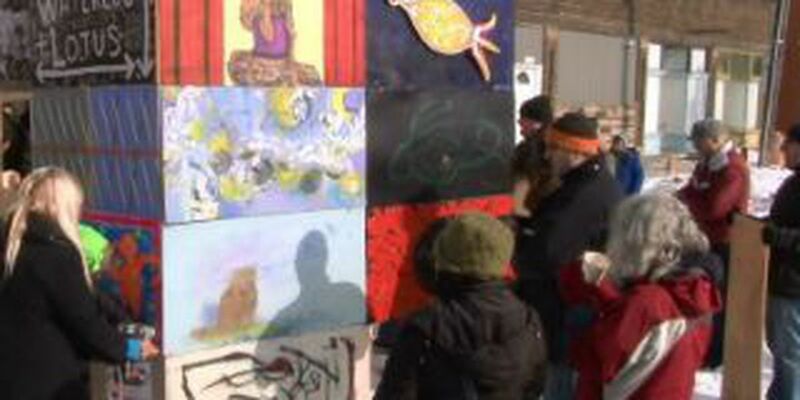 On Saturday, January 18, a group of artists gathered together for a unique outdoor project called Moon3. A partially constructed 8x8x8 cube in the form of panels was placed on a triangle grass area near the art tower on Waterloo and E. 156th Street in Cleveland. The cube was then covered in canvases, and painted by 32 local Cleveland artists. Once the paintings were completed, they then attached their art to the plywood panels, forming the exterior surface of Moon3. The interior will house the work of one installation artist.